I took a vacation to Vermont over the weekend and ended up staying one day more after my return flight was canceled. Though I mostly had phone and Internet access throughout my stay, there were points during my stay where I had no connection at all. The loss of access gives you some perspective. You realize how much communications technology has become woven into the fabric of our everyday existence. I don’t know how many times I reflexively reached for my MDA to look something up online only to be disappointed to discover I had no access. I was hardly roughing it; all my hotel rooms had broadband access, the Burlington airport had wifi, and for the most part of my trip, my phone had Internet access. But getting shut down forced me to forget about work and focus on other things. 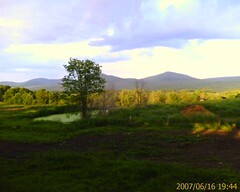 Such as Vermont’s tremendous natural beauty. The incredible vistas in the mountains with a quality of light that suffuses the deep green flora in a soft glow. It’s easy to get caught up in the everyday details of business so you do sometimes need to both take a step back and literally smell the roses and, if you’re lucky, get the creative juices flowing again. That natural beauty was breathtaking and inspired creativity; and that’s not a bad thing at all for business.